Last week happened the first cloud computing event outside of U.S. and tried to evangelize this new and in my opinion very promising concept to more conservative (or backward?) Europe. 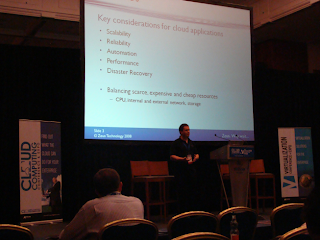 Cloud Computing Expo Europe took place in Prague on May 18-19, 2009. I was luckily one of the attendees and here is a short summary and some of my takeaways. The opening key note had Roman Stanek the guy who stood behind the birth of NetBeans Java IDE and Systinet and probably the first successful Czech entrepreneur. Roman is currently building up his next company called GoodData which is obviously connected to cloud computing - it is a collaborative analytic on-demand. You can find his presentation how to build great companies in a cloud here. Next key note was given by David Hanacek, Product Marketing Manager for EMEA at VMware. I haven't played with VMware products yet (but hopefully I will) so I found his presentation interesting as well, even it was more business-oriented as the whole Expo. After this talk began other parallel events within this conference and that's the only thing I would reprehend to organizers. There were three events going on - Cloud Computing Expo, Virtualization Expo and Cloud Computing Bootcamp, so even I was there I had a feeling that I was missing out something permanently. But probably due to time constraints organizers chose this more packed format what is understandable. But let's get back to the conference. 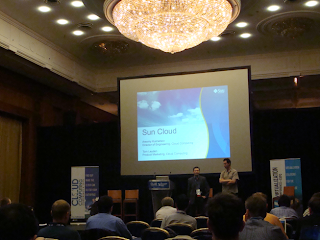 Sun promoted their new Sun Cloud initiative. They will be offering a full-fledged software stack for large data centers and service providers around the globe and will empower them with the ability to virtualize their infrastructure and provide additional on-demand services on top of their current hardware stack. The demo was pretty cool showing how you can design and configure the basic elements of your virtual IT infrastructure such as load balancers, firewalls, databases and web servers literally within seconds. Sun's cloud is based on Q-Layer technology where Sun acquired Q-Layer with its IP at the beginning of this year. I remember that I saw a video demonstrating all these cool features on Q-Layer website before they got acquired, but I couldn't find it anymore, may be you will have more luck. Another thing I found particularly interesting was the business model which encompasses the Sun's cloud. In contrast to Amazon Elastic Cloud, Sun goes further and offers a viable business model, where you can as a service provider by implementing Sun's cloud become a reseller and sell your cloud services to other clients or service providers. I hope I got it right, otherwise correct me if I'm mistaken. Another interesting talk was given by Owen Garret from Zeus. Guys there are doing pretty cool stuff with Layer 7 switches. Basically L7 switches allow you to manipulate with traffic and especially with content on the highest level of the OSI model, on the application level. This has far reaching consequences when in comes to virtualization of network infrastructure, automation of network devices or designing of applications. You can programatically change the behavior of your underlying network elements or create rules for routing traffic, etc. Owen showed us simple, but useful example, how you can easily change incorrect HTML content on the fly without even touching the application logic, with powerful, yet intuitive TrafficScript™ residing in a L7 switch. I would say that these L7 switches extend the reach of automation and can do all the magic with content delivery that was not possible before and will play the crucial role in next-generation virtual data centers. - Folks from The Server Labs presented feasibility and viability of massively scalable cloud platforms, in particular Amazon Elastic Cloud, for processing of astrometric data. - Pau Garcia-Mila talked about cloud computing operating system eyeOS. I hadn't heard of any OS in clouds before, but I've tried it out and it is pretty rich, you should check it out too! Lukas Vlcek, one of the cloud guys I met there put a nice post about it on his blog. And the very last talk was given by Sam Johnston representing the Open Cloud Computing Interface initiative which aims to bring a flexible, open and extensible API for managing of virtual machines (IaaS API). 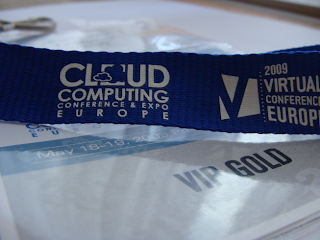 To sum it up, Cloud Computing Expo Europe was a great opportunity to see the best-of-the-breed cloud solutions available on the market, to meet new people and cloud enthusiasists. More pictures from the event are available here. And you can find me on this page as well (small help, I like red wine ;o) Thanks to folks from Sys-Con for organizing this wonderful event and bringing this innovative technology closer to our attention. See you in one year again in Prague!